Best Stores to Buy a Bridal Lehenga Choli Online – Prices, Details and More! Bridal shopping can get quite exhausting. Walking in the gallis of Mangaldas market, Chandini Chowk or Bhuleshwar is both fun and frustrating all at once. With so much progress in fashion, science and technology too – bridal shopping gets a wee bit fuss free too! Yes, that’s right – online bridal shopping for the modern bride. Buy your dream bridal lehenga choli online with an abundance of e-commerce websites offering a wide range of bridal sarees, bridal lehengas and more it bridal online shopping gets way more comfortable. With so many options available, we understand buying a bridal lehenga choli online might get a little confusing. Hence, we’ve filtered down to the best of the best bridal lehenga choli stores and shops online just for you. A trusted bridal wear vendor established in 1985, Satya Paul is India’s premier design label with an International presence. A brand known for their innovative designs, modern silhouettes and fresh colour palettes, Satya Paul seeks to keep brides-to-be updated with the latest in bridal fashion. With over 35 stores present across India in Hyderabad, Mumbai, Punjab and Delhi, Satya Paul also now has an e-commerce portal where you can buy a bridal lehenga online – fuss free from the comfort of your home! On a mission to spread the desi-ness all over the world, Indian Roots seeks to bring Indians back to their roots, quite literally. Whether it’s a kalidaar lehenga or a patola saree, the founders of Indian rootswant to make available to the masses, designer wear for weddings, handcrafted silks and exquisite accessories too no matter where in the world they are. You need not walk in the heat in Delhi or Kolkatta to get that perfect silk saree, Indian roots brings a stunning range of choices to you in the comfort of your home. A brand with a unique promise of bringing to customers wedding lehengas, wedding sarees and engagement wear that is premium yet wearable fashion.Their designs seek inspiration from all around the world – whether it’s international high fashion couture or the hand woven silks from India itself. With a plethora of designs available and amazing customer service you can rest assured that your bridal lehenga or banarsi silk saree will be delivered on time, just as beautiful in reality as it looked on screen. One of the largest designer brands in India today, Ritu Kumar now makes her designs available worldwide through her own website as well as leading e-commerce websites like Jabong, Amazon and Myntra.A company known for their distinctive use of color, designs and fabrics brings a fresh feel to bridal wear with every new collection. Whether you’re looking for a bridal lehenga Cholis, Kids Clothing, Indian Ethnic Wear for Men, Designer Sherwanis, Kurta Pyjama or Pathani Suits – Cbazaar is your one stop shop! Featuring 350 talented Fashion Designers, Dressmakers, Programmers, Designers, Customer Engagement Executives – you are assured an easy online experience. It is the largest online Indian Ethnic Wear Store offering a myriad of Indian Ethnic Wear for men,women and kids and has patronage in over 130 countries – so whatever kind of lehenga you’re looking for, you will surely find it at Cbazaar. A global online store for designer ethnic wear with a mission is to provide gorgeous handpicked designs in wedding sarees, designer anarkalis, bridal lehengas lehengas, and more – bringing together designs, fabrics and weaves from all across India at the best price. They guarantee 100 % authenticity of the product as it is directly sourced from the manufacturer or a licensed agent. Featuring designers like Manish Arora, Ritu Kumar, Tarun Tahilani, Anju Modi, JJ Valaya, Gaurav Gupta, Manish Malhotra, Varun Bahl, Abu Jani Sandeep Khosla, , Satya Paul and many more - Exclisively brings to you worldwide shipping along, A-listing designers with convenient and secure payment options. Plus technology that adapts to the user’s needs – whether you need a fish-cut lehenga or a kalidaar one, Exclusively helps you find the ideal look you desire. Indiwear brings to you bridal wear across the spectrum. 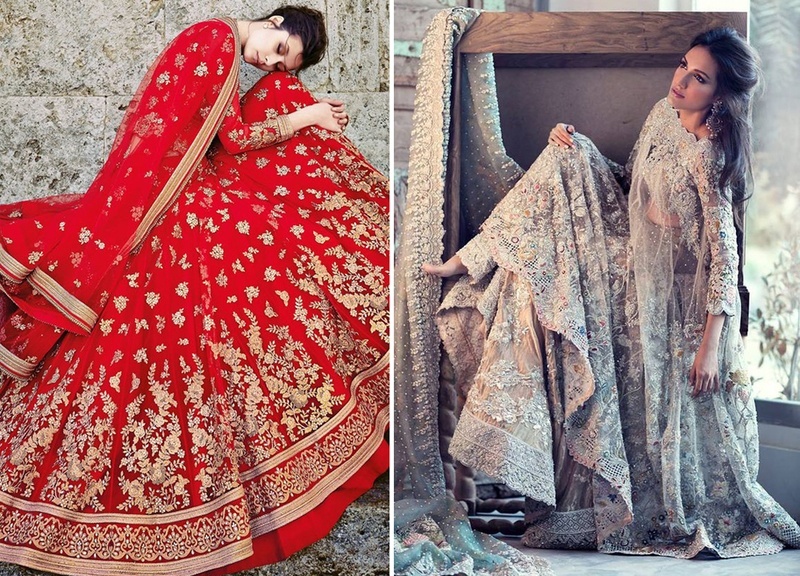 From traditional red and gold bridal lehengas to contemporary-chic shimmery gold ones. Indiwear encompasses the needs of women world over – woking with the best indian designers, artisans, manufacturers and suppliers too. Quality online shopping that won’t let you down! The Weddingz.in shop is associated with ace designers like Ritu Kumar, Mandira Bedi, Ashna Behl, Bubber Couture and more. With an option of custom making your bridal lehenga too, we have artisans in different parts of the country who can personalize your wedding lehenga or saree exactly the way you want it. Opt to order online from big brands or call in and personalize your wedding wear to perfection!